On Friday November 18, 2016, two new movies were released in theatres. A Manoj Pandit movie ‘Chhaya’ and Samir Balami’s movie ‘The Famous’ were the new release. The movie ‘Chhaya’ is about child abuse. According to data, every one girl-child in 4 girls and one in every 6 boy-children are abused in Nepal. The movie produced by Voice of Children and Interact Media addresses the child abuse issue in the society. In many cases, the parents are not aware of such abuses. The director of ‘Greater Nepal’, ‘Dashdhunga’ and ‘Badhshala’, Manoj Pandit has tried shed light in the ignored aspect of children safety in the society. The movie features Anup Baral, Aruna Karki, Saibrat Acharya, Prabina Khadka, and Prakash Dahal in main roles. 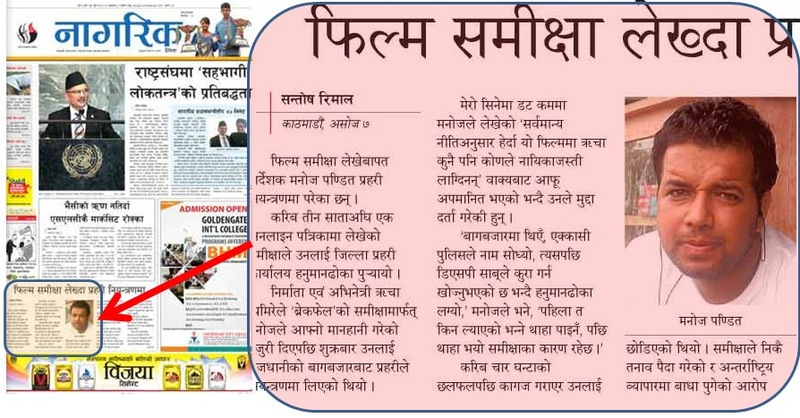 The music in the movie is composed by Kali Prasad Baskota. Nepali documentary, ‘Greater Nepal’ is about the Sugali Treaty and how Nepal lost a huge chunk of the land to India. The Rana regime dis an agreement with the British rule in India at that time to give up the land on the East and West part of Nepal. Because of that treaty, a large number of Nepali speaking community live in those area including Sikkim, Darjeeling, and Himanchal Pradesh.